US visas are available for fiancé(e)s of US citizens. The K-1 fiancé(e) visa allows your foreign-national fiancé(e) to travel to the US to marry. You must get married within 90 days of his/her arrival. After the marriage, the visa applicant is eligible for a two-year conditional Green Card, giving him/her conditional permanent resident status. If after two years the marriage is still stable, the foreign-national spouse may apply for a 10-year, non-conditional Green Card and eventually US citizenship! The first step in the K-1 visa process is for the US citizen fiancé(e) to file Form I-129F, Petition for Alien Fiancé(e). Form I-129F is to be filed on behalf of the foreign citizen fiancé(e) applicant. The purpose of this USCIS form is to show evidence of your relationship and also to provide an Affidavit of Support. An Affidavit of Support is a contract between the US government and the US citizen sponsor, promising that he/she is financially capable of caring for the immigrant applicant. Once the I-129F petition is approved, the foreign-national fiancé(e) may apply for a K-1 visa through consular processing with the US Department of State, Bureau of Consular Affairs. The applicant will be working with their local US embassy or consulate to process their application. The K-1 visa applicant should file Form DS-156, Nonimmigrant Visa Application; Form DS-156K, Nonimmigrant Fiancé(e) Visa Application; and Form DS-230, Application For Immigrant Visa and Alien Registration, with the US Department of State. A medical examination, a valid passport, two passport photos and evidence of the relationship with the US sponsor and visa applicant will be required with the above forms. The visa applicant will need to attend an interview at the nearest US embassy or consulate. If this interview is successful, the applicant will be granted a K-1 visa and may travel to the US to marry. 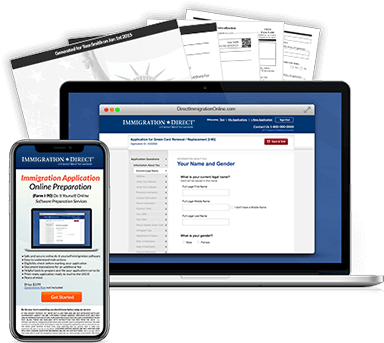 Our Application Package includes all the forms you need to send to the USCIS for processing. It also includes personalized filing instructions that tell you exactly how to properly file your application with the USCIS. Application Package Fee: $95. USCIS Filing Fee: $535.